Steve Jobs is structured as a three-act play and, like a stagebound production, it features few sets and relies heavily on acting, pacing, and dialogue. By always putting the characters under the pressure of a ticking clock, Boyle creates a constant sense of urgency. With the restlessly moving camera preferring long, swooping takes to short, static ones, there’s a sense of movement and energy that belies the limits of the locales. It’s not unlike last year’s Birdman, although the approach isn’t as fanciful or extreme. At the center of the chaos is Steve Jobs (Michael Fassbender), the iconic co-creator of Apple whose wardrobe of a black mock turtleneck, blue jeans, and New Balance sneakers became his uniform. Jobs is undeniably brilliant with an arrogance to match his intelligence. He believes in his own infallibility, accepting it as a defining precept. He mellows with age but not so much that he is willing to concede anything to anyone. Act One takes us to 1984 where Jobs is unveiling the Macintosh in front of an adoring audience. As the curtain prepares to go up, control-freak Jobs is stalking his underlings behind the scenes, browbeating Andy Herzfeld (Michael Stuhlberg) to get the demo computer talking, driving his assistant Joanna Hoffman (Kate Winslet) nuts with his complaints and demands, and berating his ex-lover, Chrisann Brennan (Katherine Waterston). Chrisann has brought Jobs’ daughter, Lisa, with her. She wants him to know that his offspring is now living on welfare because his child support payments are insufficient. Jobs refuses to acknowledge paternity but nevertheless forms a fragile bond with Lisa. His relationship with his daughter comprises the movie’s emotional core as things change and evolve over the next 14 years. Act Two occurs before another product launch: 1988’s NeXT Cube. No longer with the company he founded, Jobs is plotting revenge against those who ousted him, especially Apple CEO John Scully (Jeff Daniels). By 1998, the time period for Act Three, Jobs is back at Apple and more at home in his own skin. He has mellowed, to the extent that anyone with his personality could be said to “mellow.” The event is the product launch of the iMac. For Apple, this is a turning point - the beginning of the company’s ascendancy. Before the presentation, he clashes with several people. One is his old buddy, Steve Wozniak (Seth Rogen), who wants Jobs to acknowledge the efforts of the Apple 2 team - something he refuses to do. Another is Lisa who, at age 19, has set aside some of her illusions about her father. Michael Fassbender, who is a lock for the Best Lead Actor nomination he should have gotten for Shame, doesn’t bear a strong physical resemblance to Jobs. In fact, Ashton Kutcher, who played the role in 2013’s lackluster Jobs, was more effective in capturing the character’s look. But Fassbender is a magnetic, compelling presence. We never once doubt that he is Steve Jobs. His force of personality, enhanced by Boyle’s shot selection, holds the audience in awe for two hours. The supporting cast, which includes such heavyweights as Kate Winslet (almost unrecognizable), Seth Rogen (perhaps the best dramatic performance he has given), and Jeff Daniels (in a role not dissimilar to the one he played in The Martian), provides an element of balance but no one steals a single scene from Fassbender. As a psychological profile, Steve Jobs is probably shallow but the decision to focus on his personality rather than the events of his life make this a more interesting account than Jobs or the documentary Steve Jobs: The Man in the Machine. The dialogue crackles with wit, anger, and passion. 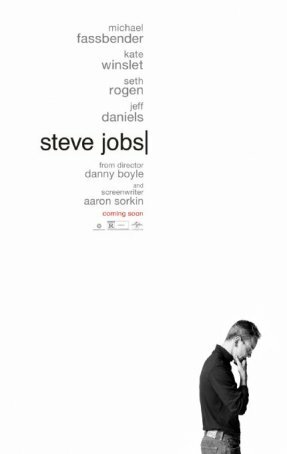 By matching Sorkin’s words with Boyle’s style and Fassbender’s talent, Steve Jobs has hit the trifecta. Although based on Walter Isaacson’s book, it fudges history a little in the name of compelling cinema. The movie’s portrait of the title character is likely to leave viewers ambiguous as they struggle with the question of how much arrogance, boorishness, and incivility can be forgiven in the name of genius. Steve Jobs doesn’t so much tear down the myth of the man as reshape it into something more volatile.